Can a town that has defied history survive climate change? North Carolina Gov. Pat McCrory (right) walks through the devastated town of Princeville, N.C., with Mayor Bobbie Jones in the aftermath of Hurricane Matthew. Photo courtesy of McCrory's office. TARBORO, N.C. — Ten days after he evacuated from his home on the other side of the Tar River, out of a home that flooded 17 years before and, now, a home that had just flooded again, the mayor of Princeville returned to his city. Bobbie Jones, a part-time mayor and a full-time high school vice principal, walked across the bridge over the Tar River hand-in-hand with other leaders. Escorted by their faith and the state National Guard, Jones and the others were there to survey what was left of Princeville after Hurricane Matthew. The river, swollen in the days after the storm dumped 15 inches of rain, surged around — but not over — levees that had been fortified after the last flood. Crews by then had pumped more than 75 million gallons of water from Princeville back into the river, leaving behind dry roads but a town vacant of the 2,000 people who gave it life. Three of the city's sewage lift stations had been flooded and still needed mucking out. The elementary school was a soggy mess. So were the fire station and the town hall. So were many of the homes. There wasn't much to return to in Princeville, founded by freed slaves as Freedom Hill following the Civil War, and considered to be the oldest U.S. city to be officially chartered by African-Americans. 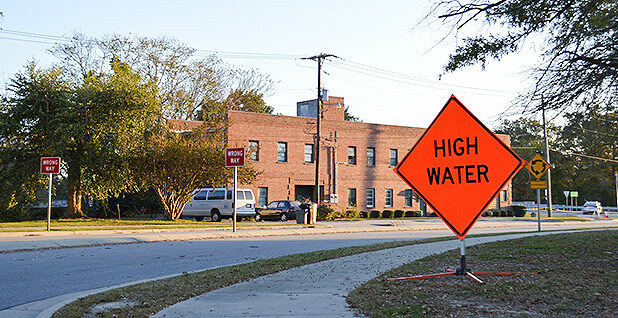 That history, though, was among the reasons the town's residents decided to turn down a state and federal buyout after Hurricane Floyd-driven floodwaters nearly destroyed it in 1999. Jones, who was rescued by helicopter from rising waters after Hurricane Floyd in 1999, saw his home rebuilt once before, after the first flood. A few days after the floodwaters crested and then receded, he pledged to again rebuild. Too much history was at stake in his town, he said in an interview. Too much pride. Too much toil. "What we have to understand is that from the time Freedom Hill was established, we were in swampland," Jones said. "But our forefathers, with absolutely nothing, no education, but they had their skills, their crafts, they built a city out of absolutely nothing. And if they did that back in 1865, we certainly can do it in 2016. "It's not only possible; we're going to do it," Jones said. "We're going to rebuild Princeville." What if this time around, though, it's not up to Princeville? What if the prospects of more flooding from climate change, the politics and economics of a second federally funded cleanup, and, not least, the fatigue of Princeville's own residents swamp the town's pride, history and best intentions, and leave it little more than a historical marker on the side of the highway? Princeville's cultural history may be unique. Its precarious future in the face of climate change is not. Up and down the East Coast, cities face sea-level rise and intense rainfall events that are challenging their very existence. Some — like Miami Beach; Norfolk, Va.; and New York City — have the foresight and the resources to adapt to the worst of the problems. That might be to buy out property owners in floodplains, to strengthen flood-control defenses such as levees and to retool building codes so that new construction is elevated, or to ban new buildings entirely in floodplains. In the coming years, Princeville and towns like it across the country are likely to see more catastrophic rain events characterized as once-in-500-year or even once-in-1,000-year events. They already are experiencing them, said David Easterling, a climate scientist with the National Oceanic and Atmospheric Administration's National Centers for Environmental Information in Asheville, N.C. The southeastern United States has suffered a 30 percent increase in such events since the middle of the 20th century, he said. In the Northeast, it's a 60 to 70 percent increase, he said. "As temperatures warm up, the atmosphere can hold more moisture," he said. "So we've seen increases in the amount of moisture in the atmosphere. If there's more moisture in the atmosphere, there's more available to rain out as a heavy rainfall event." More frequent events could challenge traditional methods of planning for floods, like using 100- and 500-year floodplain maps to plan communities and develop flood insurance rates. "These events are probably going to try to increase based on our understanding of the atmosphere and how it will change with climate change," Easterling said, "and so you need to be prepared." But not everyone can be bought out — or wants to be bought out — particularly in Princeville. "We can't just pick up and move to try to prevent catastrophe," said Jones, the mayor. "If it's not a flood, it's fires. Fires in California every year. If it's not the fires, it's the earthquakes. You can't prevent God's work from occurring. You can do the very best that you can to keep people alive. I believe the dike will do that for us in Princeville." 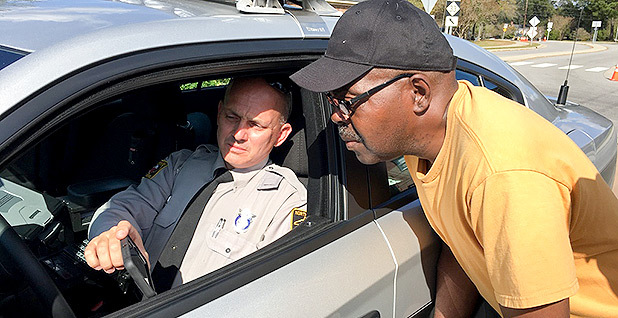 A North Carolina state trooper shows Eugene Jones, 61, video footage he took of Princeville at the height of the flood. Jones, who lives in the town, was one of hundreds of people waiting to see what had happened to their homes. Photo by Erika Bolstad. He's referring to plans approved by the Army Corps of Engineers, which in December released a recommendation to extend levees so that floodwaters are less likely to seep around the existing levee, as they did in Matthew. The plan, at an estimated cost of $22 million, "does not eliminate all remaining risk, as the unique physical situation of the town would prevent any complete reduction of flood risk, short of relocation (and removal from the flood plain) of the entire community," the Corps noted. Lisa Parker, a spokeswoman for the Corps, said the agency is committed to the levee work it recommended once Congress approves the money for it. The agency also noted that the levee improvements might not have met its cost-benefit analysis requirements were it not for an executive order signed by then-President Clinton. It set up a council to look at Princeville's future, saying that it should consider the "unique historic and cultural importance of Princeville in American history" as it worked to "protect Princeville from future floods." Matthew was especially cruel to the poorest people in its path. Hundreds died in Haiti, and the death toll continued in Florida, Georgia, South Carolina and Virginia. In North Carolina, 27 people died, although none of those fatalities were in Princeville or surrounding Edgecombe County. The Federal Emergency Management Agency already has paid out $60 million in disaster assistance to victims of the storm. More than 108,000 people are registered for FEMA aid. As of midweek, the agency had seen 18,000 Matthew-related claims to the National Flood Insurance Program. In Princeville, though, there are just 138 flood insurance policies. It's a small number that raises some alarming prospects for the town's recovery, especially since 594 households in Princeville have applied to FEMA for federal assistance. That gap means many people did not have flood insurance — and many were likely to be people who were required to carry a policy because they received federal disaster assistance after Hurricane Floyd in 1999. If their policies have indeed lapsed, that means they not only don't have insurance, but also are not eligible for federal disaster assistance to rebuild their homes. And that means many homes could go unrepaired or, more likely, be abandoned entirely. FEMA couldn't determine this week how many people might be in that situation, but it's unlikely to be limited to Princeville. Roads into and out of Princeville were closed for nearly two weeks after Hurricane Matthew flooded the eastern North Carolina town of 2,200 people. Photo by Erika Bolstad. There are many uncertainties in an era of climate change, said Gavin Smith, director of the Department of Homeland Security's Coastal Resilience Center of Excellence and a research professor at the University of North Carolina's Department of City and Regional Planning. Smith oversaw the Mississippi Office of Recovery and Renewal after Hurricane Katrina and also served as an adviser on long-term recovery after Floyd to then-North Carolina Gov. Jim Hunt (D). "We have designed communities in a way that reflects the climate of the past," he said. "These are going to be really big, pressing issues. How are we going to plan for deep uncertainty, and how are we going to modify human settlements that do reflect this previous climate?" There are no clear answers yet for Princeville, and the question of whether to rebuild is not something anyone brings up openly in the fragile early days after the flood. State and federal officials are focused on the short-term housing and food needs of some of North Carolina's poorest communities. In Princeville, the per-capita income is just $12,000, 44 percent of the national average. But the question was raised during a North Carolina gubernatorial debate between Republican incumbent Gov. Pat McCrory and his Democratic challenger, Attorney General Roy Cooper. Since the hurricane, McCrory has closed a significant gap in the closely watched race. 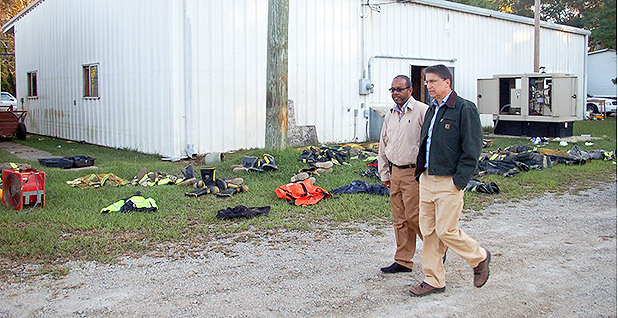 McCrory, who visited Princeville earlier this week, couched rebuilding Princeville as an "if" during the debate. He said he was creating an advisory task force of engineers, architects and environmentalists to consider such questions. "We're going to have that discussion," McCrory said. "If we do rebuild, where and how? And what methods do we use to rebuild? And I think that question needs to be asked in every area that has constant flooding." Cooper during the debate pointed to the work done after Floyd to buy out flood-prone properties. Such mitigation was "a wise thing because they were flooded again," he said. "But clearly we have some places like Princeville and others that were hit twice," Cooper said. "And we're really going to have to have some strong conversations about that." There were emotionally and historically compelling reasons in 1999 to rebuild Princeville, a town named for one of its founders, Turner Prince, and a place that told "a story of black determination," wrote North Carolina journalist and historian Victor Blue in 2000. "In the hazy, first days of freedom," Blue wrote, "former slaves like Turner Prince labored to create a sacred, living place for themselves and their progeny. Some of their descendants have remained in this space for generations — defying periodic floods, the threat of white supremacy, and public ignorance of the community's very existence — because it reminds them of this past." For some, though, the past represents the heartbreak of losing everything for a second time and rebuilding yet again. Deborah Thomas, 49, outside the day care center where she has worked since 1989. Thomas, who lives across the river in Princeville, doesn't intend to go back. Photo by Erika Bolstad. Deborah Thomas, 49, left home with enough clothes for about two days. 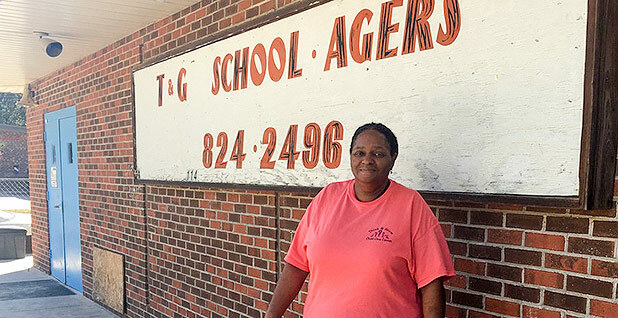 Her family of seven has been living in a hotel while they search for a house and she continues to work at the day care center where she has tended children since 1989. It's not easy, Thomas said, and housing is in short supply. They need something big enough to accommodate her two children, ages 17 and 20, as well as her husband, who had a stroke last year. Thomas is also the guardian for two young children, ages 4 and 2. Her sister also lives with her. "This is really, really affecting my family, it really has," Thomas said. "I'm trying to hold it together for everybody, and I'm like, 'What do I do?' None of this was in the plan." They still owe about $8,000 on their mobile home, she said. It replaced the home her mother owned, which that flooded during Floyd. The mobile home is a total loss, Thomas said. They also discovered after the storm hit that their flood insurance policy had lapsed or been canceled. Two of their four cars also flooded. "We can't go back," she said. "It's already been a loss two times." She knows the decision might be different for older residents who cannot see living elsewhere. "They're going to have to go through it all again, like before," she said. "The older people are talking about, 'Well, I just got this house, and just paid off this SBA loan from the last time,'" she said. "They don't want to start all over again like that." Eugene Jones, 61, is among them. "I rebuilt it, and slept good for 17 years in it," he said of his home. "I rebuilt it 17 years ago, and when I go to bed and pray to the Lord, guess what? I'm smiling. "Things happen," he said. "If FEMA doesn't help me, I'll save my money and do the best I can. Sleep in one room at a time. Build one room at a time." The mayor, too, remains firm in his faith that his town will rebuild. "More important than financially and physically, I want them to come back mentally and spiritually whole," Jones said of his fellow townspeople in Princeville. "I've talked to a lot of people, and they are so frustrated because they feel like life has dealt them another blow," the mayor said. "But we are a resilient people. We've been through this before, several times before, and we're still standing strong." "I just have to get them to believe we can do anything," he said.